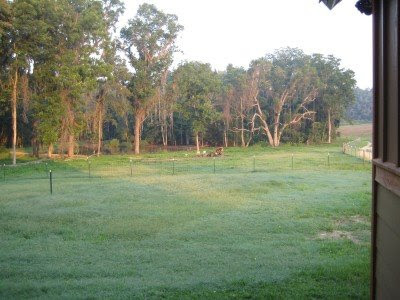 As I looked out on our little piece of heaven this morning, saw my animals playfully enjoying the day and seeing our peanut field enjoying yesterday's inch of rain.... I was thankful. Our family has been enjoying this land for almost 70 years and we are thankful to have the privilege of being stewards of it. But not too many states away, there are families looking out over their land and seeing a completely different view. Over 5 million acres are gone. That number may not mean that much to the average American. Let me put it this way: 2500 family farms. Gone. I guarantee that the world will feel this. Corn, wheat, soybeans, beans.... beef, poultry, pork..... staples that America supplies the world with. We didn't grow corn for years because of the low price... $2 a bushel. Today it is $8. And climbing. We don't mind making money, but never at another farmer's expense! As I said in a previous post, times are only going to get harder. Here he is ladies and gents... my husband the politician. After a long hot walk in the Watermelon Parade and lots of hand shaking and smiling and "How ya'll doin?" ----- I feel like we are officially in the race! 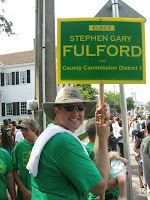 Walking in a parade as a political candidate is definietly a rite of passage that everyone should do at least once. The door-to-door visits have also begun and have been quite successful. Yesterday, he met a couple that he called "true democrats." (which in our area is not all that common... ever heard of a "southern democrat"? ) And in talking to them, the husband looked at the wife and said, "Can we vote for a Republican?" Her response was... "We can vote for this one!" Three cheers for 2 more votes! What have you been hearing all over the news and out of everyone’s mouth? Complaints about high gas prices, high food prices, bad economy, and the sad state of affairs we are in here in America. While these things are “true” I must say, it is getting old. Everyone wants someone to blame for it all, some explanation for it all, and some definitive answer on when it will end. Well, here it is folks: we are all to blame, we are doing it to ourselves, and it won’t ever change. Hard times are here to stay! Our food has always been cheap. Our clothes have always been cheap. Our gas has always been cheap. And by cheap, I mean compared to the rest of the world. The “rest of the world” is not a group of people that American’s often think about. The “rest of the world” has never had cheap food, gas, or clothes. They have, for the most part, been 3rd world countries with little hope of rising out of that. Newsflash: They don’t live like we do. They don’t drive 2-3 cars per family. They don’t live in 4 bedroom mansions. They don’t eat out 5 times a week. They don’t shop at Whole Foods and Gap. They walk to work and school, or take public transportation. They have gardens. They make their own clothes or have just a few outfits. They have very modest homes with kids sharing bedrooms. They don’t eat fast food. They don’t need much. Oh, but here…. We need A LOT. We need choices! What we want has become what we need. And it has finally caught up with the middle class in America. We don’t think it’s fair. We whine and complain and moan that we can’t get what we want anymore. But is that really true? I still see people pulling their boats behind their giant SUV’s. Now, that gas bill is something that will max out a credit card. I still see people loading up their grocery cart with junk food and imported produce. I still see people wearing new clothes. I still see kids talking on cell phones. I still see everyone living in a beautiful home with a manicured yard and even a pool! How bad are we really hurting? I was talking to an 80 year old man last night. We were on this exact subject. He said, “I hear people saying these are hard times. These aren’t hard times. I was a kid in the depression. Those were hard times for America. These kids don’t know nothin’ about hard times.” And I believe him 100%. Could you imagine everyone in your neighborhood not having a job? Literally not having any money in your pocket to buy food for your kids? Having one pair of pants and they are full of holes? This is pure desperation folks. And how many of us have experienced something like that and looked around and everyone else was in the same boat? Very few people under the age of 75 have. All of us complain, but very, very few of us make changes. We simply can’t help it. We have gotten used to a very high standard of living and we can’t come down from it. We want what we want and we want it now. We are actually getting a taste of what the “rest of the world” has been living with for years.